This guide is written by Dasima, a Warrior expert in Midwinter who is well versed in analyzing logs, running simulations and theorycrafting. Dasima has been playing World of Warcraft since vanilla launch day and has been playing a warrior since the Burning Crusade. Fury is a fast-paced spec that focused on using Bloodthirst to gain rage, Raging Blow procs, Enrage, and Bloodsurge procs. Throughout a fight you will use your raging blow procs and rage dump with Wild Strike while trying to maintain Enrage via Bloodthirst and Berserker Rage. Fury can be played as Single-Minded Fury (1-handers) or Titan’s Grip (2-handers). Both specs play the same way. Single-Minded Fury is slightly behind Titan’s Grip on single target and AoE but is entirely viable and stronger than Titan’s Grip if your 1-handers are higher ilvl than your 2-handers. Currently, Fury is very competitive on single target damage although your damage range will be quite large due to how much RNG affects our rotation via Bloodthirst (enrage procs = enrage refreshes and you get more rage, bloodsurge procs, Sudden Death procs). The Warrior has one resource which is called Rage. You gain rage by auto-attacking an enemy target while in Battle Stance, using Bloodthirst, and gaining an enrage proc via Bloodthirst or Berserker Rage. Bloodthirst by default gives 10 rage, if it crits, you get an enrage proc which gives an extra 10 rage. Using Berserker Rage also gives an enrage proc (aka 10 rage). We can hold up to 100 rage (120 with Glyph of Unending Rage) and going beyond that wastes the rage. Rage is expended via our four main abilities – Raging Blow, Wild Strike, Whirlwind and Execute. Raging Blow is a cheap way to expend your rage while Wild Strike is the expensive dump (45 rage, 20 with Furious Strikes) that you’ll use above 20% for single target and Whirlwind any time there is 2+ targets. Any time a boss is under 20%, Execute becomes the main spender. It’s important to realize that you’ll essentially weave your abilities together and there’s multiple ways to do it meaning it doesn’t matter if you Raging Blow before Wild Strike (and vice versa), as long as you used both in between Bloodthirst uses. This passive is the core of Fury. Enrage increases your damage by a base 10% (increases with Mastery). This is what allows you to be able to use 1-handers and 2-handers. It increases your 1-handed damage by 30% and your offhand gets an extra 50% increased damage. Your 2-handed offhand gets a 25% increase. This is what allows you to hit multiple targets with Raging Blow. Every time you Whirlwind, you gain two meatcleaver stacks which in turn allows Raging Blow to hit two extra targets (stacks to 4, aka two whirlwinds). A melee ability that does a small amount of damage via the main-hand. This is the main ability to use as Fury. This gives you 10 rage, Bloodsurge procs, an Enrage proc (if it crits) which in turn gives a Raging Blow proc. A melee strike ability that hits with both weapons. Gained from enrage procs. The ability is essentially a filler between Bloodthirsts and is used for aoeing via Meat Cleaver. A melee strike ability that only hits with the offhand. Has a .75 sec gcd (not affected by haste) and costs 45 rage (or 20 with Furious Strikes). This is our main rage dump. A melee strike ability that hits with both weapons. This is our rage dump whenever the boss is below 20%. It lives up to its name by doing a massive amount of damage. AoE ability, generates Meat Cleaver procs. It’s important to note that you will occasionally be rage starved and won’t fill your gcd’s because of this. Make sure to pool rage before 20% for execute as well as saving cd’s for the execute phase. Try to line up your cd’s with trinket(s) if possible. Keep Bloodthirsting to help maintain rage and enrage. Execute over Bloodthirst if your cooldowns are going to wear off within the next gcd. Execute is worth ~2.5 Raging Blows so it is worth using if you’re below 15 rage and it won’t ultimately cost you an execute unless you’re able to get off 3 Raging Blows (in increments of 3, i.e. 6, 9 and so on). For two targets, if one of the targets is below 20%, use execute rotation. Level 90: Avatar or Bloodbath for single target. Bladestorm for AoE. T45, 60, 90, and 100 are all personal preference on single target. AM and Siegebreaker are both good, however, if you want to run Siegebreaker then use Avatar with it. Decreases Charge’s cooldown to 12 sec from 20 sec. It can be good if you’re consistently needing to charge around in the interval of 11-18 seconds. Gives two charges of Charge and typically you’ll have enough downtime on your target before needing to charge again in an encounter. Charge now has a 1.5 sec stun. If you liked playing warrior before they nerfed Charge, this allows that. It has next to no place in PvE. Instant 10% heal with an additional 20% over 5 sec. ER is a very strong cooldown when you don’t need to directly reduce damage taken due to its’ strong healing and low cooldown and it is off gcd. When below 35% hp, you gain 25% leech. The only time this talent would ever be useful is if you were consistently below 35% which is never. It is however useful in old raid content. If for some reason you didn’t like Enraged Regeneration, IV is the alternative. However, it only heals for 15% hp and requires a gcd but it is only a 30 second cooldown. Allows you to run a “Wild Strike spam” spec that does just that – allows you to consistently dump rage into Wild Strike. The upside to Furious Strikes is damage consistency – you don’t have to deal with an rng proc. The first downfall to Furious Strikes is tied directly into Wild Strike – the .75 sec gcd. If your latency isn’t godly low, you will ultimately lose gcd’s because of it. The second downfall to it is its’ uselessness on anything aoe related. And lastly, it creates an overwhelming feel because most of the time you aren’t able to expend your rage quick enough to not having enough gcd’s. Gives you a free execute whenever it procs. The upside to Sudden Death is that it is RPPM which means it will eventually proc within a time limit. The greater upside to it is that it is capable of proccing many times in a short period of time greatly inflating your damage. The downside is just the same…it’s capable of proccing as little as possible hurting your dps. Bloodthirst now has no cooldown. Overall, it’s a weak talent and should almost never be taken. Bloodthirst’s damage is miserably low and as your crit goes up, your enrage uptime becomes better and better which in turn makes your rage generation better which makes this talent even less effective. The damage is lackluster right now (barely more damage than a Raging Blow). When you’re getting a good flow of bloodthirst crits, you’re swapping out a gcd that could be used on a RB or two wild strikes for that Storm Bolt which only gives a small dps increase. Shockwave is a cone aoe that stuns all mobs in the cone. This should only be used when you need a stun for the mobs or there is consistently 3+ targets. Combining the 3+ target cd reduction of Shockwave with AM is stronger than Dragon Roar. The go-to talent for single target and aoe. Does damage to all mobs within 8 yds and is a guaranteed crit. With Dragon Roar being a guaranteed crit, it allows you to alleviate a gcd that would go to storm bolt and give it to an RB or two WS’s. This is increasingly useful during Recklessness for example where you wouldn’t Dragon Roar because it already has a guaranteed crit and giving that gcd to an RB/WS would be more useful. Gives your entire raid Spell Reflection. Not very useful in raids. The Developers make sure of that! Replaces Intervene; 20% damage reduction to whoever you safeguard for 6 sec. It’s a decent talent, especially if you have another warrior in the raid where you can be safeguard buddies for an extra cd. One of the reasons you’d be brought to a raid is another cd for tanks. 30% dmg reduction for 12 sec is very strong overall. Avatar makes you look awesome for 20 sec while increasing your damage done by 20% on a 1.5 min cd. This and Bloodbath are interchangeable; It comes down to whatever you prefer. Bloodbath is a straight 30% damage increase for 12 sec in the form of a bleed that does damage over 6 sec. The damage is added into the bleed as you do damage while Bloodbath is up. With the low cd, Bloodbath is easier to line up if you aren’t positive of the kill times on a boss to line cd’s up with 20%. The go-to talent for any aoe encounter. You cannot use anything else while Bladestorming except Enraged Regeneration. Every 30 rage you spend, your cd’s of several abilities are reduced by 1 sec. AM is an interesting talent because it can allow you to get an extra Recklessness into a fight or allowing you to get another bladestorm off on an aoe pack. You place down a whirling axe that cannot move and lasts 10 sec. Ravager is a decent single target and aoe talent. Its’ downfall is when tanks drag the mobs out of it as well as when mobs die too quickly. Just another ability to hit that does damage. It’s decent on single target and can be ran over its’ counterparts. I’d only recommend using it with Avatar because it does not line up with Bloodbath. Mandatory glyph because it allows you to pool more rage and helps alleviate the problems of rage capping. Adding extra mobility is huge for most encounters. Removes threat generation from defensive stance is really nice when needing to actually use defensive stance. It can be a decent glyph if you’re consistently aoeing. Use this glyph any time you need to interrupt. Sometimes stuff isn’t perfectly stacked up, this hugely helps with that. I personally love the sprint after heroic leaping. Run glyph of Rude Interruption for free damage. Avoid the crystal that is thrown into melee. If you’re going to get rolled over, use Die by the Sword to parry the roll. Don’t get hit by stampers. Pack Beasts spawn time varies but the majority of the packs will spawn every ~30 seconds which means you’ll only get to Bladestorm every other pack even with AM. However, AM still affects Recklessness with compliments 4pc T17 very well and Ravager’s usefulness will last ~5 seconds IF the adds aren’t moved out of the Ravager. Set up 4 Meatcleaver stacks (via two whirlwinds) when the adds come out to get an instant 5 hit Raging Blow. Cleave the spears when applicable. Avoid standing near the tanks as they take hits from Overwhelming Blows which hits 10 yds around their location. Make sure you’re optimally using Bladestorm by waiting for the wolves to group up as much as possible. Anger Management allows you to fit a bladestorm in between the first two significant aoe packs and allows it to line up for the last 3 massive aoe packs as well as allowing Recklessness to line up with every aoe pack that matters. Run Rude Interruption glyph and interrupt the caster for free damage. Enraged Speed glyph will allow you to run through the fire line without taking two stacks. Alternatively, you can also leap through it to only take one stack. Save cooldowns for bellows operators (while they’re pulling the chain) and primal elementalists. Run Rude Interruption Glyph and interrupt Feldspar plus the firecallers (and Slag elementals when appropriate). Avoid the bombs during that phase but you can live through a single bomb hit by just using defensive stance. Rotate cooldowns in phase 1 during the massive demo waves. Use Defensive Stance right before every Massive Demo hits. Rotate cooldowns effectively (ER 1st/3rd, DBTS 2nd or whatever suits your specific strategy). In phase 3, you can charge back to the boss after being knocked away; Make sure to immediately heroic leap out of the slag spots to reduce your damage taken. This will help alleviate the problems that occur via Bloodthirst not critting while maximizing your damage overall. The technical statweights are for if you’re consistently hitting a single target and does not take into account times where you’re going to be bladestorming for example which would make Mastery and Crit much, much stronger than haste. Strength is a primary stat that provides 1 Attack Power (AP) per point. A majority of our abilities use a percentage of attack power to the damage they deal. Mastery: Unshackled Fury further increases how much damage we deal via enrage. Critical Strike increases the chance to critically hit with abilities and autoattacks. Haste increases attack speed while simultaneously reducing our GCD and the cooldowns of all of our abilities except Wild Strike. Multistrike causes abilities to have a chance to hit a second and a third time, each dealing 30% of the initial damage. Bloodthirst multistrike crits do not proc enrage. The best addon around for tracking cooldowns, buffs/debuffs, energy/focus/rage, trinket cooldowns, etc. 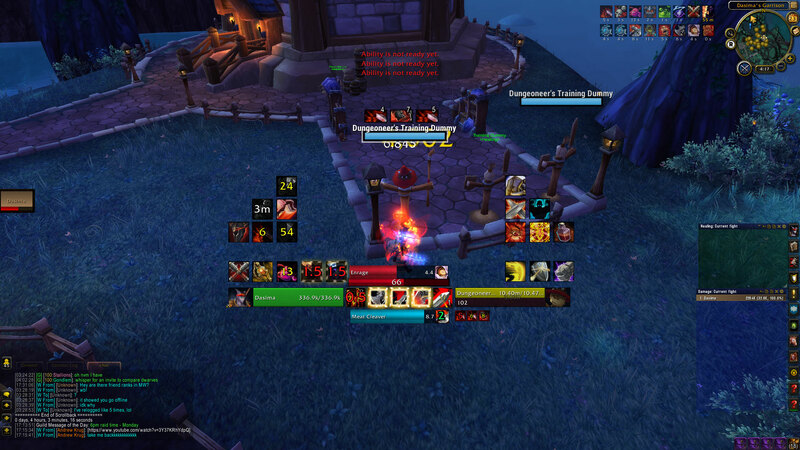 WeakAuras are fantastic for tracking important boss abilities that would affect you allowing you to out-do any of the current boss mods out there.